When a rock suddenly appeared in front of the Opportunity rover on Mars last month, scientists were puzzled. Now, scientists at NASA's Jet Propulsion Lab say they've solved the mystery. Back in January when the rock — which scientists helpfully described as "about the size of a jelly doughnut" — was first spotted, a number of different options for how it got there were thrown around including that the rover itself had done it, a meteorite strike, and aliens (except not, because it wasn't). So, who was the culprit? Opportunity itself it turns out. The rover rolled over a larger rock, first breaking it, and then kicking a fragment — Pinnacle Island, as the rock eventually became known — over with its wheel to land right in front of the camera at just the right moment. Scientists figured it out by following a time-honored detective's trick — they followed the tracks. 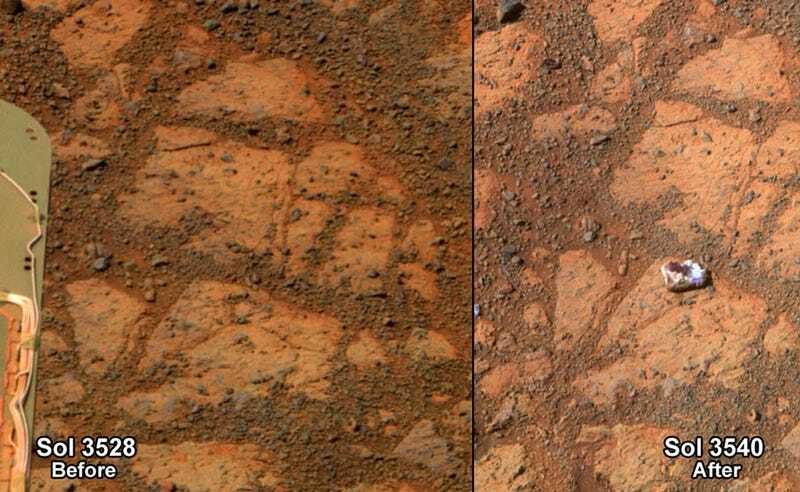 "Once we moved Opportunity a short distance, after inspecting Pinnacle Island, we could see directly uphill an overturned rock that has the same unusual appearance," Opportunity chief Investigator Ray Arvidson explained in a statement. "We drove over it. We can see the track. That's where Pinnacle Island came from."